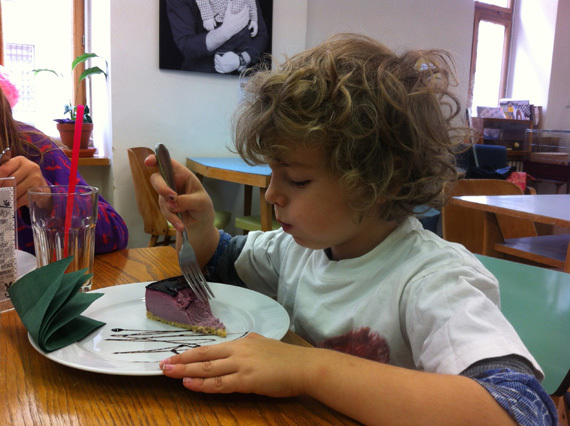 On the edge of Vinohrady, not far from Hlavickovy Sady/Grebovka is a pretty little cafe especially suited for parents with kids. It’s open to all, even well behaved dogs, but it’s star attraction is a well stocked playroom with glass doors separating it from the cafe. The big difference between here and other places is that there is a babysitter constantly with the children so parents really do get a break from entertaining their little ones. My kids are at the upper end of enjoying this place. Lucie is almost 9 and quite able to sit on her own and keep herself amused, Ari is close to 6 and was still drawn to the playroom. 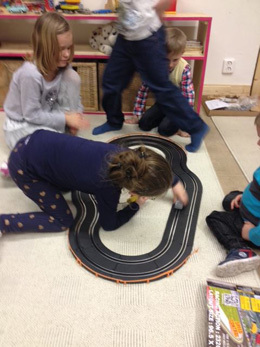 In the end they both spent at least an hour in the playroom playing with the toys, reading books and setting up a racing track with other kids and the babysitter. I was with a friend and one well behaved dog so we had a great chance to catch up without being disturbed and hassled, it worked really well. Kralik v Radiu translates as Rabbit in the Radio - an odd name, cute. As you enter sure enough there is a real life rabbit on your right side - the kids enjoyed watching her and trying to pat her. The cafe has a big area for coats, shoes and prams - it was really great having such an area in this cooler weather - the mountain of winter gear you have to get off x 3 people is ridiculous! The food here was a great surprise, light, filling and very tasty! 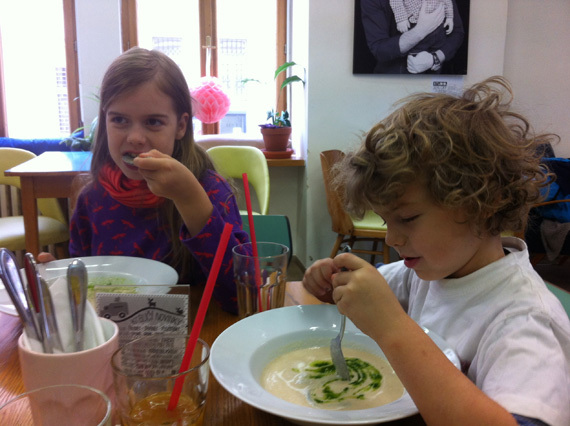 Soup is around 45-49czk and a good choice for kids, they also have a range of quiche for 59czk and a more filling daily special for 119czk. I had ‘thai-style’ chicken with vegetables which I wasn’t expecting great things from but it was actually very tasty. We also had the most gorgeous cheese cakes - one was blueberry, the other chocolate, they were definitely worth the 59czk. 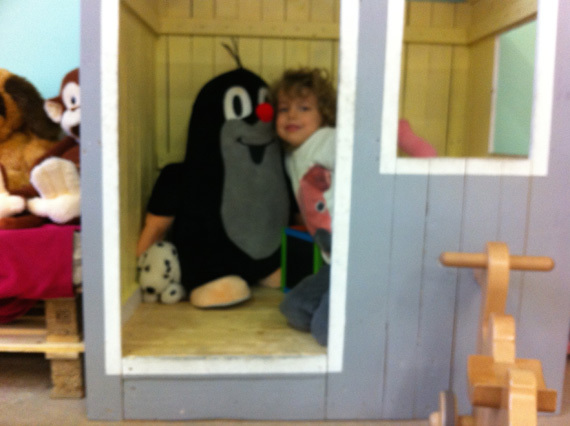 A surprise, the playroom costs 50czk per child and they add this charge to your bill. It’s clearly marked on the entrance to the playroom doors. At first this stumped me but then I realised that it’s worth the money. The babysitter is always in attendance, is attentive and keeps the kids busy so you really do get that chance for a break. Near to me there was a table of 4 women who all had young kids, they were at the cafe when we arrived and still there after we left yet they each had at least 1 child. Because the kids were entertained and engaged by the playroom these women were able to sit down and stay put for many hours - fancy that! Of course simple rules must be obeyed such as shoes off and no sick children allowed in to avoid the spread of infection. 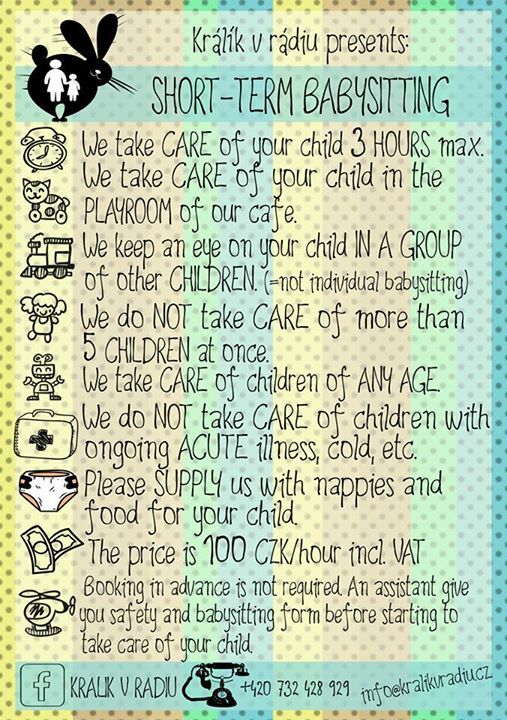 The cafe also offers Short-Term Babysitting for 100czk an hour which you can either pre-arrange by phone or just show up for. Attached is a flyer with details. 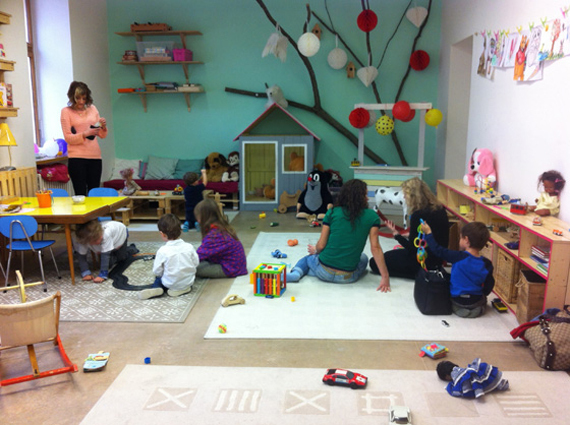 The cafe can also arrange parties, the playroom is suitable for such an occasion. The space also run mum and baby classes and even regular Storytelling with Body Language run by Jeff Zamoff from Brown Box books. 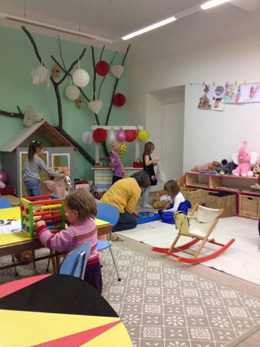 If you’ve got time then wander over to his english language bookstore and workshop space (Vykladni skrin) where they run programs for kids and adults in czech and english. It’s a 10 minute walk away from the cafe up behind the council building. DIRECTIONS: By Metro: Take the green line A to Náměstí Míru then take tram 4 or 22 2 stops to Krymská. By Tram: Take Tram numbers 4, or 22 to Krymská or Ruská. By Car: At the time of writing Prague 10 has no paid parking so you can park freely in the surrounding streets. Keep in mind that the streets are narrow, quite full and are one way so it’s easy to spend time going around in circles until you get lucky.